and relax with us a bit. whether on the trail or in the show arena. 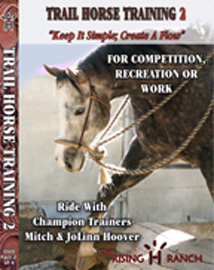 Trail Horse DVD's Now Available! 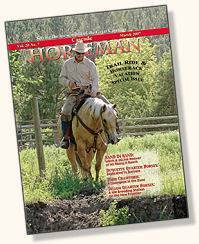 Trail Horse Training like you’ve never seen before! The Hoovers have an uncanny knack for instilling confidence in both horse and rider through their eclectic teaching style that blends compassion with respect--knowledge sprinkled with humor. 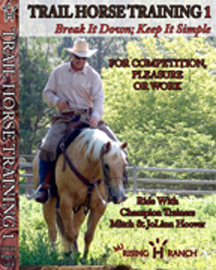 This training series will leave you equipped with tools to tackle your next Trail Horse Competition or Recreational Trail ride with confidence and ease. Get a head start on trail riding season! Call Soon! "Break It Down; Keep It Simple"
"Keep It Simple; Create A Flow"
Ground Tying and more . . .
At the MJ Rising H Ranch, we happily share a lifetime of experience in training horses and teaching horsemanship at all levels; from sturdy and trustworthy ranch horse to the polished show-arena competitor. We off you the best of both worlds with our "Natural to Practical" program! Training: Gentle Foundation Start for untrained horses. 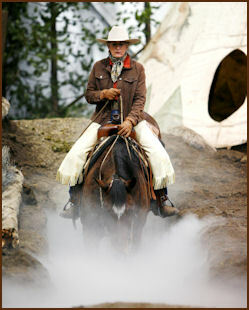 Advance your started horse to a fine bridle horse through our "Finishing with Finesse Program". Lessons: Private Riding Lessons for all age and level of riders. 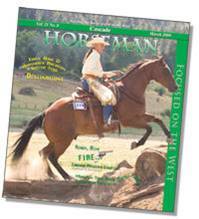 Includes instruction in basic horsemanship through advanced riding for pleasure or area performance. Small groups or individual lessons available. Clinics: Sharpen your Versatility & Trail competitions, improve your ranch working or trail riding skills or focus on your individual interests. Horsemanship skills are included in all clinics! Mountain Trail and Standard Trail: Competitions and pleasure. 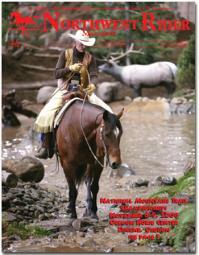 Versatility Ranch Horse: Instruction for Versatility and Ranch Horse shows. Includes cattle and roping. For competition and ranch work. Cowgirl Up! : Ladies Only! A smorgasbord of subject content from all of our other clinics. 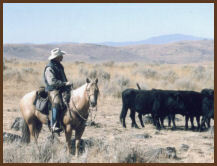 Working Stock Dog: Learn how to be the handler your dog needs you to be in "real" ranch work settings. Problem Solving Assessments: Solutions and training for "problem" horses and their owners.